I first found out about Ellen, the Friendship Doll at Hirado Kindergarten, when I received a letter this spring from Mary Elizabeth Stanfield, a retired librarian who lives in Wilmington, Ohio, and who now works as a volunteer at the Peace Resource Center at Wilmington College. About 15 years ago she wrote a pamphlet on the story of Ellen C., The Friendly Doll. She also sent me a copy of Little Mary, The Blue-eyed Doll, which is an English translation of a children's book by Eiko Takeda, a Japanese children's author who has published many books about the Friendship Dolls exchanged between the U.S. and Japan in 1927. 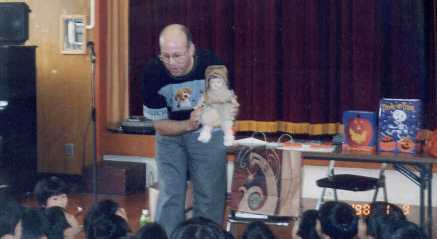 The inspiration for the book published in 1984 about Little Mary came from Ms. Takeda's visit to Hirado Kindergarten in 1982. 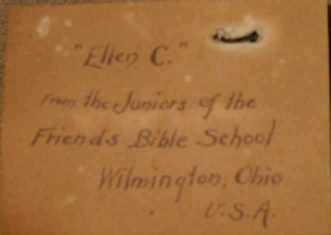 Ellen C. was one of seven dolls sent to Japan in 1927 by the Juniors of the Friends Bible School in Wilmington, Ohio, which is written on a tag attached to the doll. In 1983, Hirobumi Toyama, a high school English teacher (now retired) in Nagasaki City, wrote a letter to the Friends Bible School to try to find out more about the people who sent Mary C. as a gift to Japan. Ms. Stanfield, a member of the Wilmington Friends Meeting, responded to Mr. Toyama's letter. Hirado Kindergarten found out about the Friends (or Quakers) who had sent the doll in 1927 and about the Wilmington College teacher for whom the doll was named. 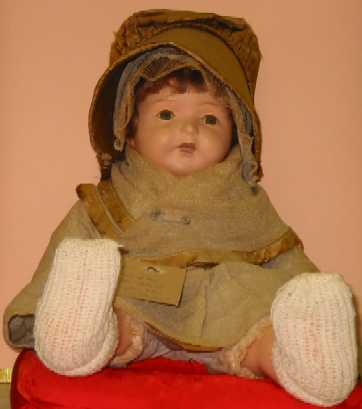 The people living in Wilmington learned that the doll sent so long ago survived World War II, when many dolls were destroyed as spies sent from the enemy. Nagasaki Prefecture received 214 Friendship Dolls from America in 1927, but only two have been found. After a long morning walk by the beautiful harbor of Hirado, I went to visit the children and teachers of Hirado Kindergarten. When I arrived, I met Yoshiko Ikeda, who worked at the kindergarten for 38 years (1952-1990) and who knew a great deal about the history of the doll Ellen. The head of the kindergarten, Mr. Matsunaga, showed an interesting ten-minute video on the history of the Friendship Dolls in Nagasaki Prefecture. Next I went to talk with the 60 children and 5 teachers at the kindergarten. The children enthusiastically sang a song, and they recited words of greeting at the beginning of the assembly and a thank-you message at the end. 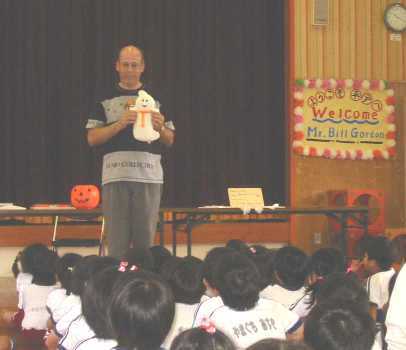 We practiced together the correct way to shake hands and greet people in America, and then I showed the children many items that Americans use to celebrate Halloween. They were quite excited to each receive a sheet of Halloween stickers and a small roll of candy. I showed them a couple of picture books, one on Halloween and one where they had to guess what was inside of something (for example, penguin inside of iceberg). When I finished this picture book, I had them to guess what was inside a large sack after giving them a couple of hints, and one child soon guessed that it was Mary, the school's Friendship Doll from 1927. At the end of the assembly, the children presented me with two large sheets of their art work and some long necklaces made from paper they had colored. After the assembly, I talked for some time with a reporter from the Nagasaki Shimbun, who had been at the school during the morning. When asked about what impressed me most about the doll at Hirado Kindergarten, I said that it was her authentic old-time Quaker dress and bonnet. Since he had never heard of the Quakers, I explained that they strongly believed in peace and were against war of all types. The purpose of sending dolls in 1927 was to strengthen relations and to secure peace between Japan and the U.S., so this is probably why the Quakers from Wilmington, Ohio, sent this doll to Japan. After lunch I had a chance to play with the children. We played soccer, drew pictures, and played a version of tag. A couple of girls showed me their talent at jumping rope, and I also gave it a try. After the playtime, the head of the kindergarten, Mr. Matsunaga, presented me with a couple of cute Hirado dolls made of cloth. 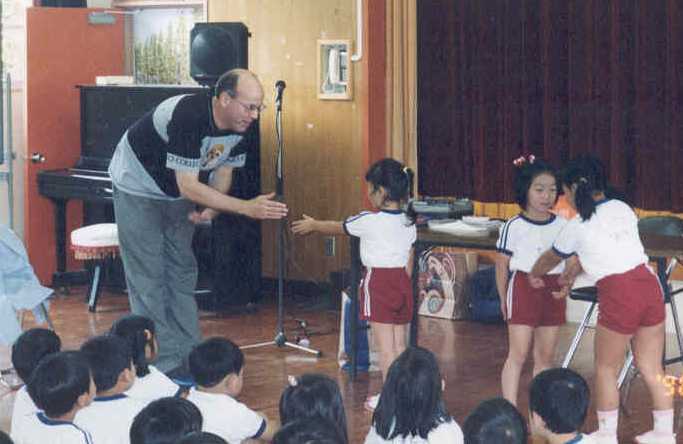 This was my third visit to a Japanese kindergarten, but he was the first man I had seen working at a kindergarten. 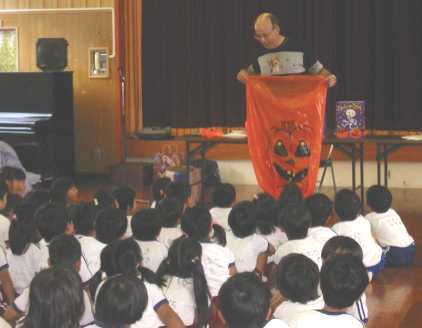 He explained that he came to work at the kindergarten about three years ago after his retirement as an elementary school teacher. I wished I had more time to see the historical sites of Hirado Island, which is connected to the main part of Nagasaki Prefecture by a long reddish-orange bridge, but I had to return to Nagasaki City for an evening party with the Miss Nagasaki Homecoming Committee. Hirado has an imposing castle that overlooks the harbor. In the last half of the 1500s and the first half of the 1600s, Hirado was a thriving trading port, and the city still retains some the Dutch influence from that time. Hirado was the first seaport opened to Dutch traders at a time when Japan had practically no contact with the outside world. As Japan's first international trading port, Hirado is the place of many interesting firsts in Japan, including bread (1550), tobacco (1601), paint (1609), and beer (1613).